For our Expert Q&A Thursday, February 7 we had Nicole Llewellyn and Jack Martin from the Public Record Office Victoria [PROV] to discuss how to get the best from the PROV collection. Thanks again to Nicole and Jack for giving us all the benefit of their time and experience. Nicole Llewellyn is Coordinator of Access Services and Jack Martin is a Coordinator of Collection Management at the Public Records Office Victoria. Start with researcher landing page – http://prov.vic.gov.au/research, PROVguides and HOW TO guides – http://prov.vic.gov.au/research/research-guides, Frequently Asked Questions by topic – http://www.wiki.prov.vic.gov.au/index.php/Category:FAQ. Think about the agency that may have created the records at the time of creation as this can assist with determining firstly if PROV may hold those records and secondly can allow you to do a broad search by agency to determine the records within our collection under that specific agency. Also, the more you familiarise yourself with how to use the catalogue, the more of the collection will open itself up to you. Texts describing how to use a series (the long links above) can reveal the best search methods. Note that the texts can be really long, and you don’t need to read the whole thing to get some benefit – just check and see if data is name searchable. For example, the first few lines of the text here, under “Description of this series”. The “advanced search” and “search within a series” then become powerful tools, allowing you to specify what you’re searching for – a government agency which creates records, or a large group of records (“a series”), or even your final destination, records (“items”). It’s worth noting too, that if you’re searching for information about an individual, you can start by just typing in their name at the advanced search, and looking for “items”. The results you get will most likely not be the whole story of an individual, but it can be a great place to start. Ultimately, our aim is to make as much research as possible as easy as this, but it’s a long process. Since 2002, though, the number of catalogue-searchable items in the collection has grown from 790,000 to over 5.5 million items now. Our Expert Q&A with Nicole Llewellyn and Jack Martin from the Public Record Office Victoria [PROV] starts in 15 minutes at 8:30pm AEDT on this page. Tonight we’ll be discussing how to get the best from Public Records Office Victoria. Please ask your questions in a comment below and Nicole or Jack will answer in a following comment. Comment: IHM: Welcome everyone, thanks for joining us. Please welcome Nicole and Jack from the Public Records Office Victoria to tonight’s Q&A. A. IHM: Early questions received will be repeated in a comment on this post, for Nicole and Jack to answer in a following comment. A. IHM: Don’t forget to keep refreshing your browser to see the answers as they appear. A. Linda: Hi Nicole and Jack – so glad you could do this for us! Thank You. A. Sharon: Hi Nicole & Jack so glad you guys are here! Q. From Louise: I have an ancestor who committed bigamy in 1890 and found details of her criminal record in VPRS 502/2 and VPRS 516/10. Which section/forms do I fill out to access these records please? Do you have any idea what information they may contain? Thank you. A. Louise: Thank you for that info Jack – wonderful! Q (b): Louise: My gg grandfather William Kenny tried to commit suicide on 6 March 1884 (thank you Trove). He was arrested and “lodged in the city watch-house” and taken before the courts the next day. Would he have a record for this? If so, how would I locate it please? Thank you. A. Carmel: Poor man, it amazes me what people were arrested for and how it was described in records, these things are treated so differently now. Thank goodness. Q (c): Louise: Re the records closed for conservation, THANK YOU – I would really appreciate anything you could copy for me please. Details;DIEDRICH, Emilie P. VPRS:516/10 Central Prison register. Also; DIEDRICK, Emily P. VPRS 502/2 17 Feb 1890. A. Carmel: The court records go to what date? A. Louise: Thanks Jack – yes, sadly, he ended up in Yarra Bend, poor man. century – click here to research. The collection from Melbourne Courts is vast – click here to research. A. Carmel: prisoner records are great even if though many were not preserved as well as all would like but they are gold if you can find them. Q. From Maureen: One of my ancestors was the first person on the scene after a very gruesome murder in the 1890s. I have found some of the details from the many newspaper reports on Trove but would like to track down the official records. My ancestor’s gold mining ‘mate’ was killed by his wife. There was an inquest in one of the hotels in Morrisons (near Ballarat) followed by a murder trial in Geelong. Would these records be available in Melbourne or would I have to go to Ballarat or Geelong to find them? Also, is there any way of finding out happened to the woman (during/after her time in jail) and the 13 year old daughter? Q. From Cameron: hello Nicole and Jack, I was wondering what records do you have regarding the colonial military forces in Victoria: i.e the various regiments, the navy and the fortifications? A. Cameron: Hi Jack, thanks for that, I realise it was a nice broad question. but thanks for that, I might get in touch offline to find out more. Q. From Tracie: Would love a copy of my great grandfathers prison record like the one above. He was convicted in 1931 under the names John David Munro and John David Hobbs. He vanishes and the family never heard of him after that. His sons were put in orphanages and his wife remarried. Have had trouble locating his prison record. Would love to see a picture of his face and find out what happened to him. Can anyone help me get his record? A. PROV: @ Tracie. We can help you with that record and more. Click this link and download the pdf. A. Tracie: Thank you so so much Nicole for pointing me in the right direction and helping me find my great grandfathers prison record. Finally get to see what he looked like and it will be an interesting read with the rest of the information too!!! Love this website!!!! A. IHM: Time for a happy dance Tracie! A. Carmel: love that happy dance, these kind of finds put you on a high for a long time. Who needs drugs just need to find a snippet of information about an ancestor! A. Tracie: Definitely!!!!! Just wish it wasn’t so late so i could call my mum and tell her! Q. From Samantha: Hi, just wondering what records you have on the residents of the goldfields areas, i.e. Ballarat? A. Samantha: Thanks @Carmel. I might be in contact with your group sometime soon. I’m in NSW so I am unable to get there in person. A. Samantha: Thanks for that Jack I’ll check it out! Q. From Leonie: How accessible are shipping records? are any available online? Q (b): Leonie: Thanks for the link to shipping indexes. if I wanted a copy of the microfiche entry but cannot come to your offices – I live in NSW can I order a copy to be sent or emailed? Would it be worth it or will all information on the microfiche be included in the index entry? A. Carmel: There is a group that do Leonie, cannot remember their name, maybe our guests know who they are. A. PROV: You can also request a digital copy of an original record by emailing us with the specific details of the record however there is a cost. Please contact us at enquiries@prov.vic.gov.au for further information. Q (b): Maureen: Like Samantha, I would love to be able to track down information about residents of goldfield areas – are miners rights records available or their permission to build houses etc? A. PROV: @Maureen. A typical series about licenses for mining is here – the record is a register of applications, which of course includes the outcome, extent etc. Therefore you get a good ideas of the miner’s “right” – click here for research. The records regarding building dwellings whilst occupying Crown Land are vast. Are you trying to find out when a dwelling was built, how long it was occupied for, whether the miner ultimately owned it? Each needs a different approach, and each is a very long explanation. Get in contact with us and we’ll talk you through it. Q. From Wendy: G’day all, one of my GGG Grans was a teacher, I know for sure she was in Sandhurst/Bendigo area, are there records of where teachers taught or other school connected records online? Thanks. A. IHM: Here’s Jack’s link again shortened :: http://ow.ly/huZXA – you need to copy the whole long link for it to work, facebook is calling the link correctly. Q. From Linda: Could you help please when copywright applications what information do they include? My g g grandmother wrote a book and it is copyrighted. Does it include a copy of the book at public records? Q. From Merilyn: I gather you don’t have records of adoptees before 1927, any other ideas? Q. From Lynda: My 2xgreat grandfather William Burns of Williamstown is described as a pensioner at the turn of the last century. This is long before state pensions existed. There are rumours he may have worked for Customs in the 1870-80s. Any ideas where I should be looking for him? A. Carmel: Are there any certificates for William Burns, like marriage, children’s births etc? These will list his occupation. Q. From Amanda: Hi I want to access a civil case file, how do I do this if I am living interstate? Q. From Corrinne: My gr-gr-grandmother Mary Jane ANNETT married Charles WIGGINS 09 March 1853 solemnized in the parish of Portland. She again married on17 November 1855 to Johannes Barends GROENEVELD in Portland. The problem is that her first husband did not die until 1901. How would I find out if her first marriage was annulled? Q (b): Corrinne: Thank you Nicole… I had thought a person had to be divorced for 7 years before they could remarry? A. Carmel: or Corrinne was that the seven year rule of not seeing a partner and could marry as it is presumed he/she is dead? A. Corrinne: Mmm but my ancestor remarried within 3 years… other than annulment or bigomy is there any other possibility I have not considered? A. Carmel: What was the condition of the person who remarried, divorced? widow/er? A. Corrinne: Maybe too late for a reply now but the divorce/annulment I was asking about was between 1853 and 1855, the records start in 1861. The second marriage was within 2 1/2 years and the first spouse had not died until 1901. A. IHM: Hi Corrinne, Nicole and Jack will answer your question tomorrow and we’ll include in the transcript, and post here. Q. From Kathryn: I’ve checked Vprs 515 for Edward Blake with no joy. He should appear between 1852-1858. Maybe ‘his’ Registers have not been digitised yet??? A. Kathryn: Police records – 1850’s? Q. 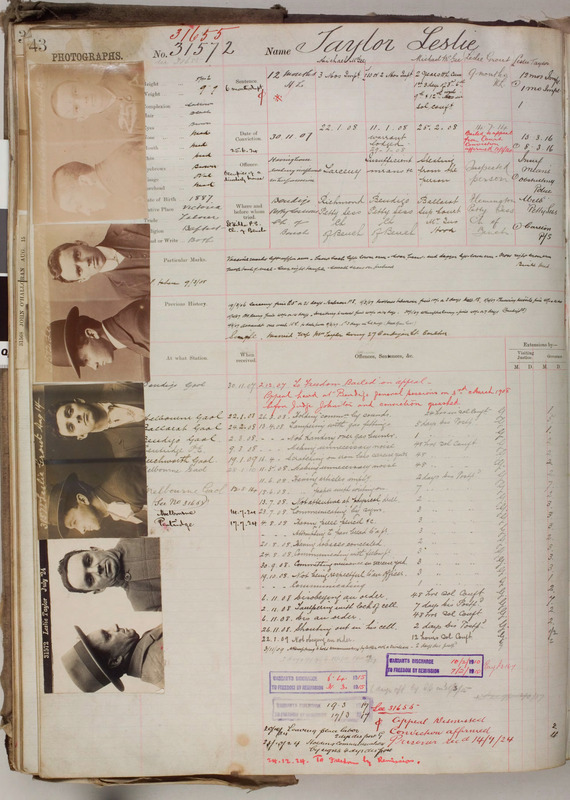 From Suz: Would other convicts have photographic records? My GGG Grandfather came in through Melbourne from woolwich, would be nice to find out more. Q. From Stratford Museum: Question on notice, please. We have the Footprints exhibition, opened one week go, and going wonderfully. We are told the paper version of the book is out of print and unavailable – and a lot of people re saying they want a copy. These are people who will not be accessing a digital version – I understand you have released it that way. Is there any chance you will be re-releasing it in a paper format? Even as a print on demand? A. Stratford Museum: Thanks re Footprints – might take names and addresses to let people know in case it does happen. Would be really good. Q. From IHM: Wow, what a session! We’ll have to finish but any questions we missed tonight will be answered in the Q&A transcript. Thanks everyone for joining us! To finish, Nicole and Jack, what would be your top tips for using the PROV collections? A. Carmel: Cassie, where do we find the transcripts for these sessions as well? Q. From Jane: If we have found a file on interest in the divorce index, are we able to obtain the record if we are not able to attend the reading room? Comment: IHM: Thanks again to Nicole & Jack for all their help tonight, and thanks to all our friends here for making family history fun!! A. Cassie: It could well be Linda but I think our friends at Trove had over 100 comments as well. Happily they’ll be joining us again later in the year! A. Geelong and District: That was an impressive Q&A – congrats to Jack and Nicole as well as Cassie and Inside History Magazine – one of my favourite reads on the train each day. A. IHM: Why thank you Geelong and District: local and family history, we’ll be posting up the Q&A transcript across the weekend & Issue 15 is nearly done! Q. From Kay: I know am late, but I live in WA. We’re three behind. Just wondering if I could get a question answered. i had a relative that was in the army at Queenscliff in 1908 that committed suicide. How can I get any paperwork on his case? A. Carmel: Kay there would be an inquest into this, if you look above it will give you details on how to check the website and ask for a copy of the transcript. Also have you checked Trove to see if there is anything printed int he newspapers. Hope this helps. A. Kay: Yes Carmel have a few different newspaper clips, found he has a daughter somewhere. A. Nicole: Here is the best place to start – click here to research. Given that you’re interstate, though, you might be interested to know that, starting soon, we’re gradually publishing inquest records for 1840 – 1925. We do provide a remote copying order service. Please view our guide under “Digitisation” which provides you with further information and feel free to contact us at enquiries[at]prov.vic.gov.au – http://prov.vic.gov.au/provguide-2. Q. From Kathryn: Trove mentions my ggg grandfather, Edward Blake numerous times as being ‘a man of colour’ and one of the ‘worst types’ in Melbourne. Many court convictions and gaol stays between his arrival in the colony in 1852 and his death on 27 April 1858. I’d love some hints in finding his prison records and any police report of his untimely death. A. Carmel: wow early start guys. I found some records on Prov web site for a prisoner. Then Police Gazettes at the time (at Prov) then able to get similar records as above. They were in very poor condition as these were not really preserved at the time. Q. From Merilyn: My husband’s grandfather was adopted and born in Victoria. I have never researched adoptees before where do I start? A. Carmel: When was he born Merilyn? A. Merilyn: Oh dear any ideas? A. Merilyn: Grandpa’s name was John Ward Ryan born in Nth Fitzroy Melbourne. A. Carmel: I found one of mine on there Merilyn but I dont think it is comprehensive. Q. What do you have in the pipeline that we should be excited about? been digitised and will be available online in the very near future. 1841 data. The project has had other unexpected results, such as the discovery of reports of marriages conducted in the 1840s which, until last year, were unknown to the Registry of Births, Deaths and Marriages. Another project is the Indexing Soldier Settlement records. PROV volunteers have been active over the last 18 months, creating catalogue data for some of PROV’s most heavily used land occupation records (so far over 1100 boxes of records have been worked on, making tens of thousands of names searchable on-line). They’ve recently commenced work on VPRS 5714 Closer and Soldier Settlement Files, with the goal of having these completed by the start of 2014, the centenary of the commencement of WW1. These records document all sorts of transactions to do with settlement and land lease-purchase schemes, largely for discharged soldiers. PROV always has 20+ similar digitising and indexing projects underway… Your research interest will no doubt determine what you get excited about! Q. What is your favourite story you’ve found in the PROV collection?